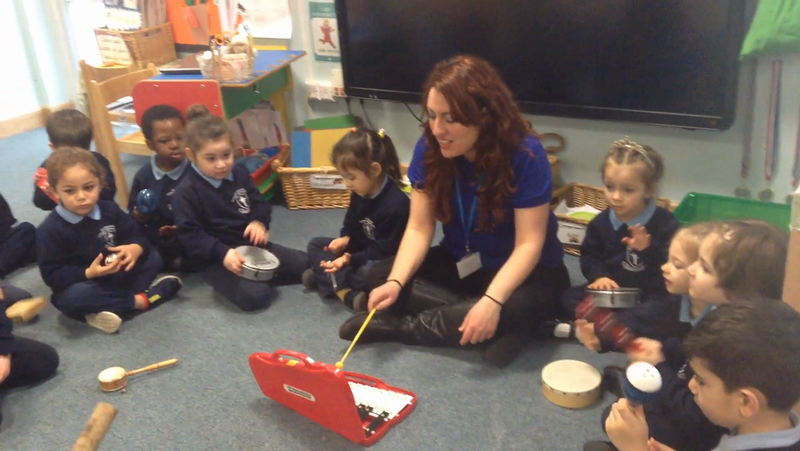 Nursery and Reception children are introduced to new songs and musical activities and learn how to accompany a song with different percussion instruments. They also learn about high and low pitch and use of dynamics in music. On the video above, Nursery children accompany 'Twinkle twinkle little star' with percussion instruments. Reception children learn the names of percussion instruments and how to accompany a song with the use of dynamics. In Year 1 children learn new songs, how to stay in time and pitch when accompanied by a guitar or piano. They are also introduced to soh/mi pitches with the use of glockenspiels and learn the notes on the stave. 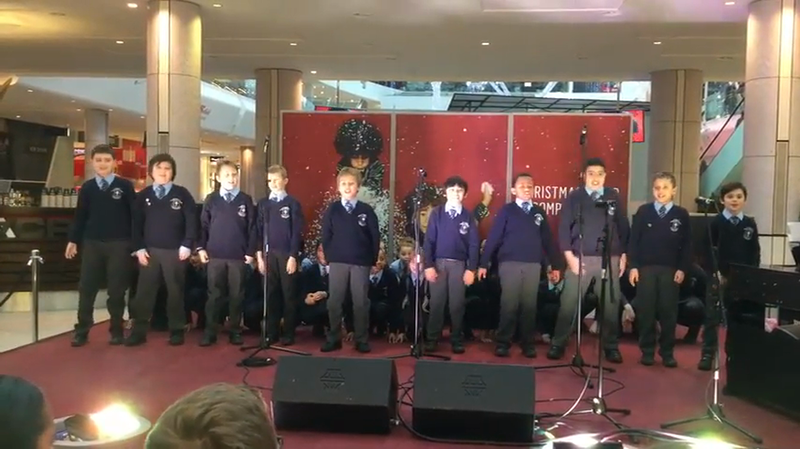 As part of the connected curriculum, they compose their own song each term based on the termly theme. In Year 2 children are introduced to reading rhythms and notation and learn how to play simple songs on the recorder. We emphasize on pitch, good sound and playing as a group. 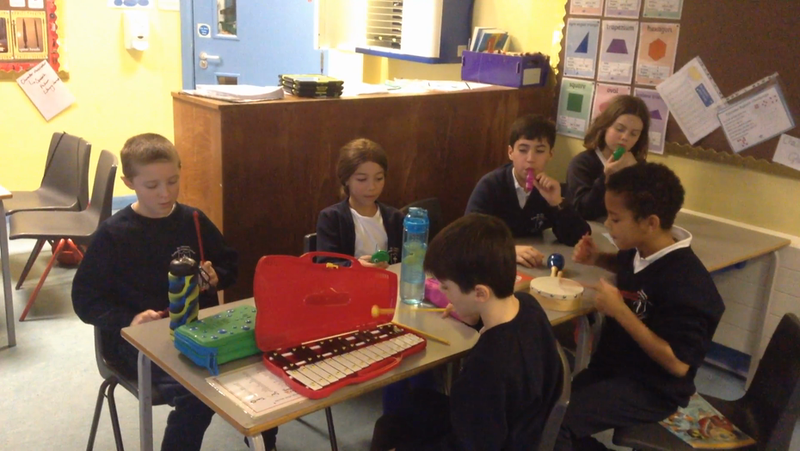 As part of the connected curriculum, they compose their own song each term based on the termly theme and play it on recorders. Year 3 children have got a weekly lesson with a visiting percussion teacher from Ealing Music Service and they are introduced to bamboo tamboos, djembe drum and drums. They also learn how to read rhythms and play them on the percussion instruments. 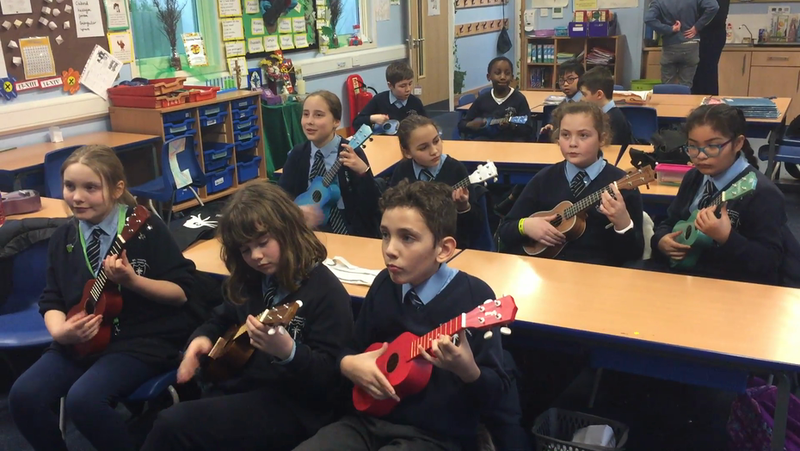 Year 4 children learn how to play the ukulele and accompany their singing. 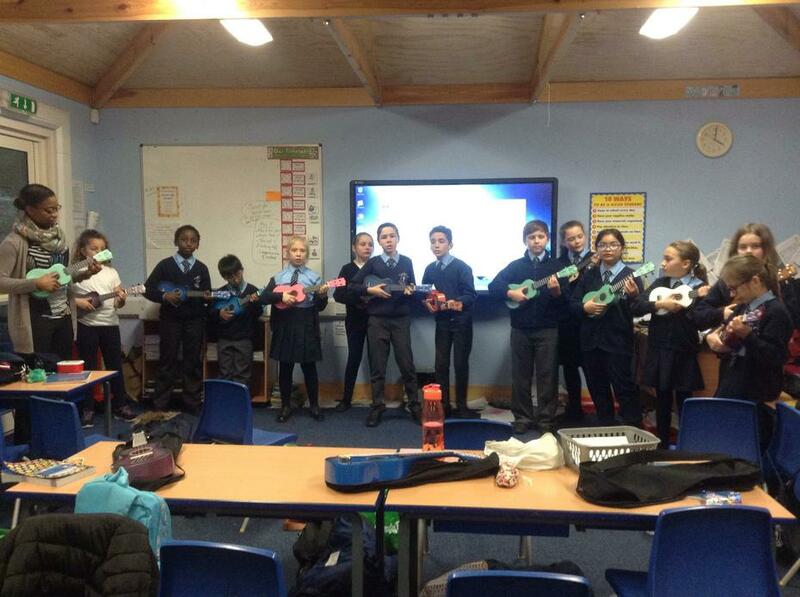 As part of the connected curriculum, they compose their own song each term based on the termly theme and play it on the ukuleles. They also learn about the instruments of the orchestra. Year 5 children learn the basics on the keyboards and revise any knowledge on rhythms and musical notation. They also compose their own song based on their termly theme and focus on singing with the correct pitch and timing when accompanied. In the Spring term we have been working on minimalist music and the children have been trying to create their own minimalist pieces. Year 5 children composed their own minimalist pieces. Year 6 children are introduced to Music Production basics with the use of Garage Band for iPads. They learn how to compose a piece of music either instrumental or having vocals, using a specific chord progression. Their compositions are based on the termly theme. 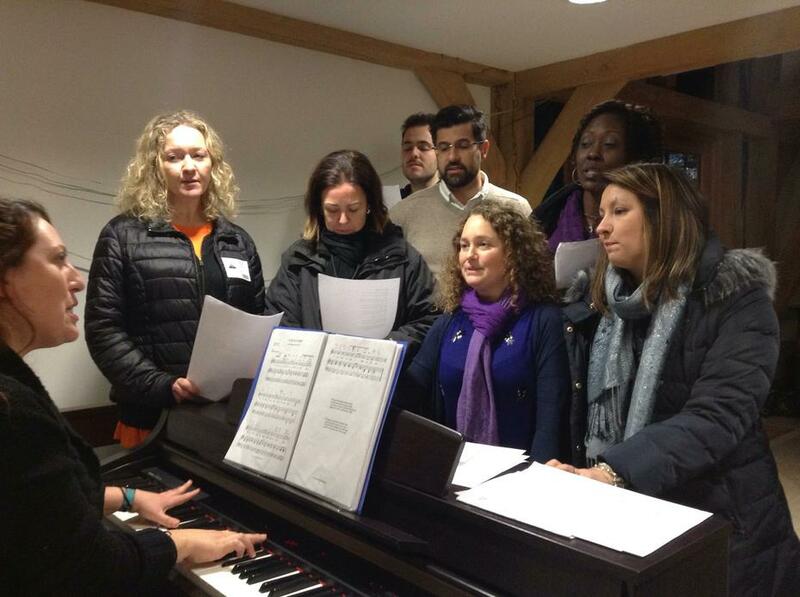 A Choir consisted by members of staff and parents. The session starts with singing warm ups and exercises that extend the vocal range, focus on pitch and timing. We work on 2 and 3 part harmony songs and hymns. 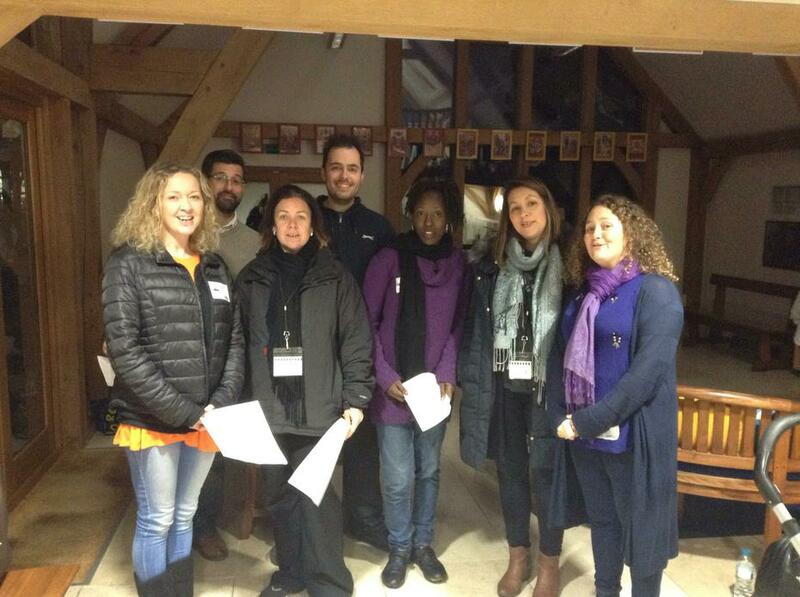 The members of the Community Choir have got the opportunity to perform at end of term performances. Parents and members of staff of all abilities are very welcome to join. No experience needed. Children learn fun warm up songs, practise hymns and songs for assemblies and performances. Ukulele is a fantastic string instrument that can develop children's understanding on music and can be a smooth start for those who wish to continue on guitar. The lesson focuses on learning how to play popular tunes and sing at the same time, so it is perfect for dexterity and coordination. Children from Years 5-6 and members of staff are welcome to attend, however there is a limit of 15 people. Ukulele Club children play the blues! Children sing fun warm ups and singing exercises that develop their vocal range and skills. They practise hymns and songs for upcoming performances and competitions, while working on correct pitch and timing when accompanied by a piano or guitar.